Steven Kasher Gallery is honored to present Chip Simone, the first exhibition by the artist outside of the American South in over 20 years. The exhibition presents over 40 digital color photographs made in the last decade. 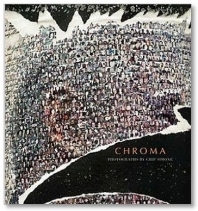 It follows the extraordinary 2011 exhibition The Resonant Image: Photographs by Chip Simone at the High Museum of Art, and is accompanied by the book Chip Simone Chroma (Nazraeli Press, 2011). Simone’s work is a unique confluence of two traditions, the American modernist photographic tradition epitomized by his teacher Harry Callahan, and the new digital street photography that has only recently burst out. Simone brings together the studied constructedness of the mid twentieth century New Vision with the nanosecond quick captures made possible by the digital photographic revolution. He is one of the first photographers to make wholly satisfying digital prints, prints both monumental and full of quicksilver 21st century perceptions. Simone is a street photographer. He describes his method: "I explored the city. Sometimes I walked, but more often I rode a bicycle and traced eccentric routes through the prosaic urban landscape hoping to see it for the first time. I lurched along, trusting happenstance and serendipity, wishing for epiphanies and praying for the sliver of light or queer shadow that fell just so and transformed the ordinary into the extraordinary." Simone describes his roots: "I grew up in an Italian-American community known as Shrewsbury Street, a working class neighborhood of three-decker tenements in Worcester, Mass. I mention this because Shrewsbury Street profoundly influenced how I see and what I photograph. Surviving on the street called for sharp reflexes and a quick wit, which was excellent preparation for becoming a photographer. Shrewsbury Street was filled with eccentric Runyonesque characters that talked with their hands and their fists: laborers and bookies, wise guys and butchers, with names like Teddy Rags and Nicky Show-Show. Men wore fedora hats and topcoats and hung out in front of all- night diners. Women cussed like men. They waited tables or did piece work in necktie factories. They wore seamed nylons, cheap perfume and furs that were sometimes stolen. It was a vulgar and textured place, full of broken language and rough edges. These were the people who I saw on the street every day, the ones who taught me how laugh out loud and to see with all my heart, and I still celebrate them in my pictures." Since 1966 Simone’s work has been exhibited throughout the United States and in France. His photographs were exhibited at the 1980 Winter Olympics at Lake Placid. In 1985 The French Ministry of Culture exhibited his work at the Chapelle De La Sorbonne in Paris, The Refectoir Des Jacobin in Toulouse and The Centre D’Action Culturelle in Angouleme. Simone’s photography can be found in scores of museums and private collections worldwide. Simone’s work currently resides in the permanent collections of High Museum of Art, Sir Elton John Collection, Museum of Modern Art, NYC, Museum of Contemporary Art of Georgia, Corcoran Gallery, Washington DC, Worcester Historical Museum, Houston Museum of Fine Arts, Rhode Island School of Design, University of Massachusetts, Amherst, Harry Ransom Center for the Humanities and more. Chip Simone is being presented at Steven Kasher Gallery in conjunction with a second exhibition Vivian Maier: Unseen Images, a first hand look at the artist’s never before developed work. Chip Simone and Vivian Maier: Unseen Images will be on view from April 12 through May 26, 2012. Steven Kasher Gallery is located at 521 W. 23rd St., New York, NY 10011.Gallery hours are Tuesday through Saturday, 11am to 6pm. For more information or press requests please contact Christiona Owen at 212 966 3978 or christiona@stevenkasher.com.